Great Communication. Great Product. Pleasure to do Business with. This 14k white gold princess halo engagement ring is exquisite! 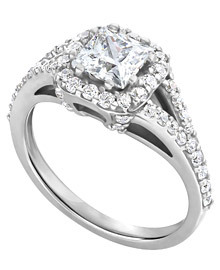 The center setting will accommodate a princess diamond ranging from 0.46ct to 1.10ct of your choosing. The ring has 50 round diamond sidestones that are G-H color and SI clarity and make up a total carat weight of 0.69 carats.